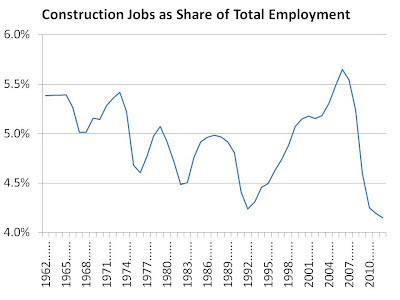 Since 1962, construction jobs have made up about 5% of total employment. 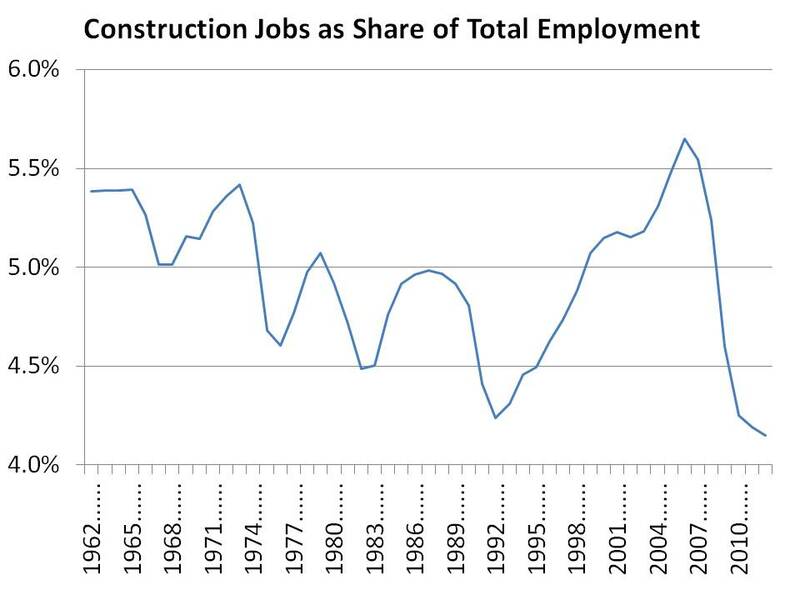 In the bubble years leading up to 2005, it would appear from the chart above that the country employed far too many construction workers, leading to overbuilding. The country is paying the price for that now, as few construction workers are now needed thanks to the supply glut. But as Buffett argues, household formation continues, swallowing up excess supply in the process. Foreclosures have fallen to five-year lows while new home inventories continue their declines, falling to "record" lows. Eventually, construction jobs will once again be required to build homes at a rate that matches household formation growth. Assuming construction jobs once again make up 5% of total employment (the average since 1962), this would add 1.1 million jobs to the country's current payroll. Isolating for residential construction yields an even starker contrast. Residential construction makes up just 2.3% of current GDP, whereas it has spent much of the last several decades between 4% and 5% of GDP. (At the peak of the bubble in 2005, residential construction reached 6.3% of GDP.) Assuming residential construction returns to normal would yield an increase to GDP of just over 2%, which would add anywhere from 2 million to 3 million new jobs at average salaries. Finally, it's important not to forget the multiplier effect housing spend has on other sectors of the economy. Not included in the crude calculations above are positive effects on other industries that supply the housing industry, but these effects are also likely to increase total employment significantly. As Buffett has remarked "employment will come back, big time, when residential construction eventually regains footing."